Our horses Tex and Sophie had been nipping at each other quite a bit before we separated them. So we put a bit of Corona on the wounds and scratches and they all healed up quite nicely with no scarring! Corona provides a favorable environment for the rapid healing of cuts, abrasion, sores, etc., with minimal scaring. Clinical tests, conducted at leading veterinary college, have demonstrated Corona's effectiveness in the healing of minor wounds. 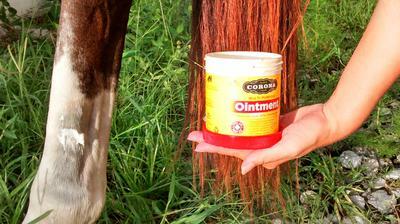 Corona Multi-Purpose ointment contains 30% Lanolin. Lanolin, the natural, protective oil of wool, has unique characteristics that make it a superior base for fine skin and pharmaceutical creams. Lanolin's ability to attract moisture and allow it to be fully absorbed by the skin makes it the best foundation available for skin, hair, and hoof care products. The paint I am leasing has some small wounds and I am using Corona on them almost everyday. It really seems to make a difference. Return to Horse Tack Supplies.